I think a lot of people that follow me probably assume I am single. I am always out and about on adventures with my close friends and you don’t see much of my boyfriend on my Instagram feed. I also wonder if people that know Brian exists see the lack of him on social media and assume we are on the verge of breaking up, that's also not true. Brian doesn’t enjoy hiking, and yet we are happy. It’s hard not to make the assumption that your significant other has to love the same things you do in order for you to be happy when Instagram is flooded with photos of picture-perfect couples doing EVERYTHING together. I have nothing against those couples, but how every individual is different so is every relationship. Brian and I enjoy spending time together, but we both also enjoy our own activities. Funnily enough, Brian was part of the reason I got back into the outdoors. I had grown up exploring the backcountry of Washington with my family but had fallen away from it when I moved to Seattle. At the beginning of our relationship, Brian and I ran up to Rattlesnake Ledge in a rainstorm on a dark evening in fall. We were vastly unprepared and I remember running down in the dark by the light of my cell phone feeling so exhilarated. Generally, I am a very anxious person, but I felt safe out there with Brian and knew we would make it down safely. We made it home and relaxed while I dreamed of the next adventure outside with him. I mistakenly thought Brian had the same dream and started planning harder hikes for us often. We would show up at the trailhead and I would drag him along while he trailed behind me complaining the whole way. He started to resent me for bringing him out and I would resent him for complaining. It turned out Brian loved doing Rattlesnake because it was close to Seattle and a good way to stay in shape, he wasn’t pumped about driving three or more hours to see a new mountain or hike 10 miles. At first, I refused to believe this and would drag him to the prettiest spots in hopes he would finally change his mind and LOVE hiking with me. That never happened. That one time I stole all the best parts of the trail mix from Brian. I have always been scared to venture out by myself or reach out to strangers. As Brian said no to more adventures it got to a point where I really needed to force myself to branch out of my comfort zone. I downloaded the Bumble BFF app and met other women to hike with there. I started conversations with nearby outdoor ladies on Instagram and over time I have created a group of women I LOVE getting out with. Almost every weekend I have someone to head out into the mountains with, and even though we aren’t always together, my relationship with Brian is better for it. Instead of forcing him to be a safety net for everything I do I am growing and learning without him. 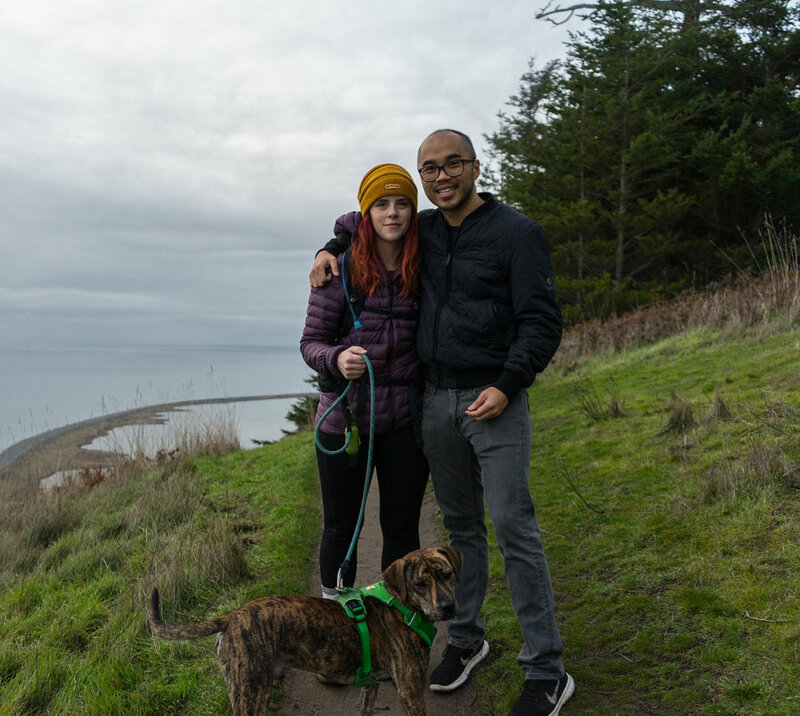 That first day we hiked together he helped me feel safe and confident, by holding his ground and staying home, he has helped me realize I am completely capable of doing that for myself. You have to give him credit for attempting to smile. People still ask me if it bugs me that Brian often doesn’t come along. When it comes down to it, it’s been about compromise. Brian loves boxing, a sport I attempted to get into for his sake. When I tried to make it a huge part of my life I resented him and everything having to do with the sport, when I took a step back and joined him on my own terms things were a lot better. I sense it’s the same for Brian with hiking and camping. It’s never his first choice for what we should do on a weekend but he joins when I ask him to, especially now that I don’t ask him EVERY weekend. Last year he planned a surprise birthday trip to Banff for my birthday even though that location has never been on his list of travel destinations. We work together as a team because we love each othe and we want to support each other. We are also content to be apart and do our own thing. That one time he took me to Banff, still no smile. That’s not to say everything is perfect, we still argue about what to do now and then. I know Brian would really appreciate it if I stayed home a little more to help him with tasks around the house, but we are figuring these things out together and it’s working for us. If you are bummed because your relationship doesn’t live up to an Instagram ideal, don’t be! There are tons of ways to be happy and enjoy separate hobbies while still loving your significant other. Brian and I aren’t, “Instagram Perfect” but we are happy nonetheless. If that’s not #relationshipgoals then I don’t know what is.